The question is no longer whether your prospects are looking for you online or not. The question is how do you get your local business to stand out and win the business your competitors … with more online visibility… are stealing from you. There are a number of places you can market your local business online, but did you know that two of the most important ones are free??!! You may be used to paying $1000s for Yellow Pages ads or TV and radio spots and you’re probably being outspent into near invisibility by the big businesses with deep pockets anyway. Yet online, if you know what you’re doing, it’s a level playing field that you can crush big businesses in your market without spending a dime. You just have to be smarter than they are and we’re going to show you how at the DIY Google Maps and Social Media for Local Business program. This program is divided into two parts, each covering an essential (yet free) strategy for marketing your business online. 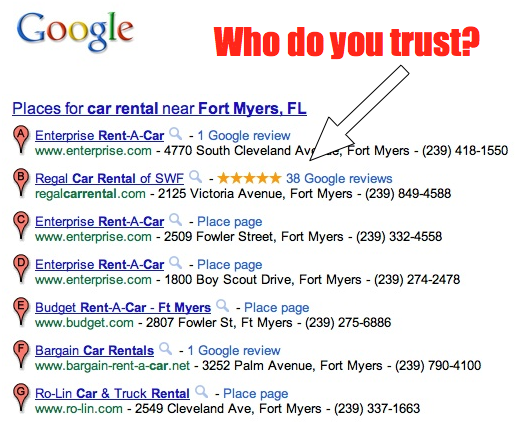 devoted to getting your business ranked on the first page of the Google Maps listing. setting up the most compelling social media profiles trifecta for your local business…Facebook, Twitter and LinkedIn. This isn’t a sit-back-and-relax kind of program. No way. You’re going to bring your laptop and be an active participant while our experts walk you step-by-step down the road to dominating your competitors in these two essential online marketing strategies. Take a look at this image from a recent eyetracking study by the website SEOmoz. Notice how most people look right past the first few search results and zero in on the Google Maps listings (and, in particular, the top 2 spots)? This part of the program is all about getting your Google Places page filled out the right way so that you can appear in this precious real estate on the first page of Google. The Importance of Business Name, Address and Phone Number. How to Select the Right Categories for Your Business. What terms/keywords is your business ranking for on the maps, if any? Are these the best keywords for your business? Are you sure about that? We’ll go in depth into keyword research to help you unearth the keywords that your prospects are actually typing into Google to find you. In past seminars we’ve done, the time we spend on keyword research is usually the most eye-opening and valuable exercise business owners go through when it comes to marketing their local business! And then, once you’ve uncovered the most critically important keywords for your local business listing, we’ll show you exactly where they need to go for maximum impact. You’ve only got 200 characters for this one on Google Maps. Got to make them count! We’ll share strategies and tips on making this key part of your business’ Places page on Google Maps stand out from the competition (and make sure you’re not penalized by Google for doing this the wrong way!). 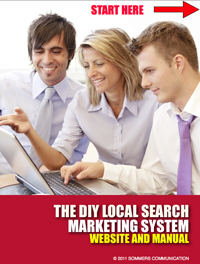 Every attendee will be getting our Exclusive DIY Local Search Marketing Manual. ValueBut it’s a PDF the likes of which you’ve never seen before! This PDF also pre-populates all your information in mock-ups of Google Places, Yahoo! Local, Bing Business Portal and another site which we’ll cover at the program which is our secret weapon when it comes to achieving top local search marketing results! So when you leave this program, everything you need will be in this manual just waiting for you to copy and paste it to the appropriate spot online. And because you’re PDF will look exactly like the online forms you’ll be filling out, you could hand this over to your 5 year old to do it for you! (included for those who attend both the morning and afternoon sessions), it’s onto…DIY Social Media for the Local Business. This tool is the secret weapon that is your command center for your business’ social media operations. You’ll learn the secrets of using Hootsuite to effectively and efficiently manage your social media presence. The strategies you learn here will literally save you hours a month and make your prospects, customers and competitors wonder how your dominating social media! How to work (and rock!) your social media platforms. Best social media practices – the shoulds and shouldn’ts that spell the difference between social media success and social media disaster. The magical mix of posts (content is King!) that will make your pages a shining star in the internet universe. The social media platforms (other than the Big 3 of FB, Twitter and LinkedIn) you need to know about. If you attend the morning session you’ll be guided step-by-step through the process of creating a compelling Google Maps listing that gives you the best possible shot of ranking highly (and literally walk away with a blueprint containing all the information you need to get it done!). If you attend the afternoon session you’ll be guided step-by-step through the process of creating an optimized profile on the Big 3 Social Networking sites and the strategies on how to use them effectively to engage your customers and win more business. Attend them both and you’ll be a local online marketing superstar that will leave your competitors scratching their heads while you’re monopolizing the leads in your industry. What’s one new customer worth to you? A few hundred dollars? A few thousand dollars? Whatever that number is, keep it in mind and think what would happen if the powerful strategies you put in place in the course of this one program generated just 1 new customer for you. Attend either the morning session on Google Maps OR the afternoon session on Social Media for just $147. Attend both sessions (with lunch included) for just $197. If you landed on page 1 of Google Maps, do you think it could lead to 1 new customer? If you set up and optimize your profiles on FB, LinkedIn and Twitter and put a real social media strategy behind them, do you think that could lead to 1 new customer? We do too, which makes this program a no-brainer. So to register, click the Order Now button and reserve your spot before your competition does! And, of course, the program is guaranteed. If you’re not satisfied for any reason, let us know and we will refund your money. Simple as that.